This project had its starting point in 2014 when Attai Chen and Carina Shoshtary, jewellery artists living in Germany, visited Gothenburg in conjunction with Attai Chen’s solo exhibition at the jewellery gallery Four. 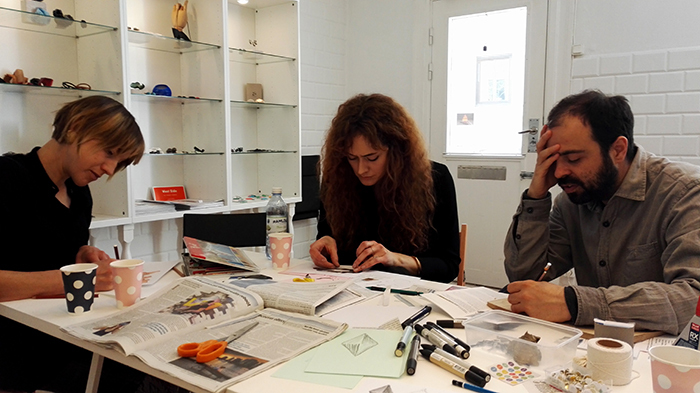 During their short stay, ideas for a future art project with a group of Gothenburg based artists started to emerge. Thanks to funding from the Swedish Arts Grants Committee’s International Programme for Visual and Applied Artists, Attai Chen and Carina Shoshtary could be invited to Gothenburg. 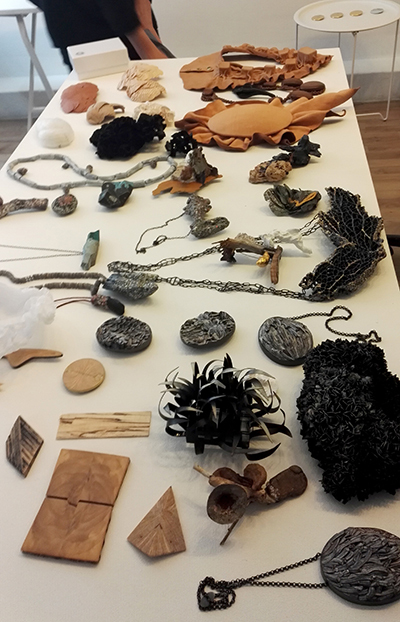 In the beginning of April 2017 they travelled to Gothenburg for a one month residency at Konstepidemin and a collaborate with us andjewellery artists Hanna Liljenberg and Åsa Christensson in the joint project Fragments. The word fragments created a stimulating framework for the project. It was a word that we all had in common in different ways. For example, all artists except Sanna currently work mostly with small fragments of materials, building larger forms by joining small parts. Sanna on the other hand mostly use one single piece of unfragmented material in her work. The word also relates to fragments of ideas, and fragments of time, which led us to conversations about how we all in different ways try to find a sustainable lifestyle as artists and balancing our artistic work, administration, family life and other work. When Carina and Attai arrived in Gothenburg we had an initial meeting at Gallery Four to discuss our expectations for the project. We all agreed that what we wanted to get out of this project was not necessarily to create new physical work, but to have a dialogue about our art pieces and artistic work in general. This dialogue and our exchange with each other was our most important goal. For our first meeting, we brought examples of our work, putting them out together to find similarities and differences between them. As we were talking about Fragments as fragments of ideas and thoughts, the idea occurred to make a huge pin board, which would serve as the canvas for new fragments and ideas. Together we built a 400×220 cm large pinboard in the gallery. As a starting point, we pinned examples of our existing work on the board, an invigorating process where unexpected dialogues between the work occurred. Pairs or groups of jewellery pieces by different artists created new meanings and associations. We had a first public opening of the project Fragments on April 12th. The exhibition display was then relatively minimalistic and traditional, but already during the opening night the installation began to change as we started to pin fragments of ideas onto the board and invited the visitors to do the same. Everybody could leave an imprint or take an idea with them. During April we had several meet-ups, sometimes in smaller groups, sometimes with all the six participants. In these meetings, we created opportunities for ourselves to dig deep into individual works, both concerning technical methods, the background and concept of the jewellery and what we tried to convey with the art pieces. We approached these meetings in a playful fashion. We made associative games, word games, drawing exercises, etc. or simply talked freely about our feelings and ideas regarding the other artist’s jewellery and working processes. This gave us a fresh perspective on the artworks and lead to a deeper understanding of each other. The drawings and word games were then added to the pin board to linger and interact with everything else on the wall. We were all also working individually and during the month we kept on pinning a variety of fragments to the board, such as new sketches, text snippets and material samples. The project period ended with a second opening on April 29th. 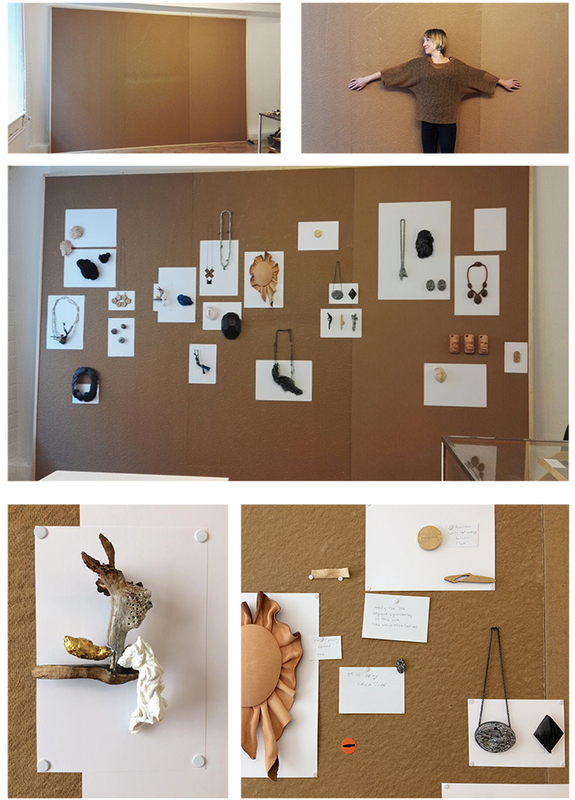 By the end of the month we, together with visitors at the gallery, had taken the pin board from a minimalistic presentation to a myriad of fragments. When the board was pinned with all sorts of fragments, it allowed new interpretations of the jewellery, both giving the individual pieces less importance as well as offering new perspectives. The visitors joined in the discussion.